The Pictwo photography app is a cool tool to blend two photos and bring a fresh, fun perspective to your life memories snapped by or saved to your iPhone’s photo library. Imbued with wit, charm, and intuitive navigation, the Pictwo iPhone app is accessible to all users, yet sophisticated enough to hook an iOS photography app geek. There are six quick steps to create your Pictwo iPhone app photo. First, you select two photos from your library or from interesting backgrounds available in the app. You make your selections simply by touching the screen. After photo selection, you position the image. You pinch the screen to pan and zoom each image individually, and you can watch the photos meld together on the screen. 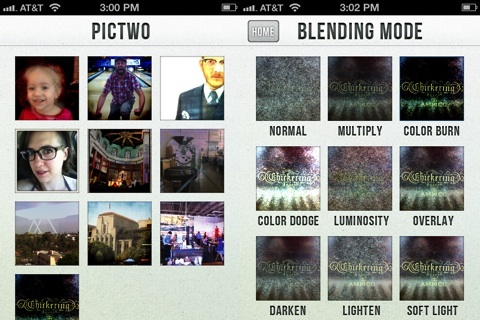 The third step is applying effects, or, in the Pictwo iPhone app, it is referred to as Blending Mode. There are nine selections that play with light and texture. The effects have a pretty aesthetic and lack an edgy vibe common in many iOS photography apps. The fourth step gives you the chance to further adjust the dominance of one photo over the other in the Opacity tool screen. Each photo is placed at either side of a volume control bar. As you move your finger closer to one image, that photo dominates the screen. 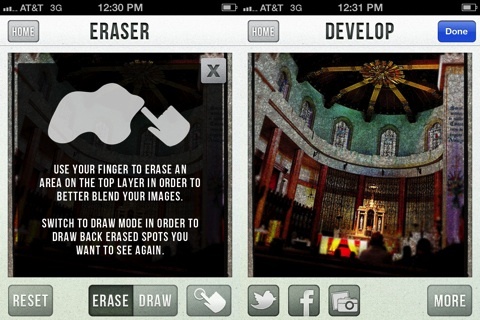 The final tool in the Pictwo iPhone app arsenal is to blend again using your finger as an eraser. You move your finger across the screen to bring more of the less dominant image to the photo. Finally, the Pictwo iPhone app photo is developed and processed swiftly and precisely. To keep you entertained, the Pictwo iPhone app tells you, “Doing something important.” You can share to Twitter and Facebook, as well as share via email. The smooth, seamless movement between tools and features is easily monitored by a menu bar at the bottom of the screen. There are arrows on each side of the bar with six circles representing a step to create a Pictwo pic. You can move back and forth by touching the arrows, and a circle is filled to indicate which step. Frequently, iOS photography apps don’t let you know how many steps are involved, and the interface for moving back and forth can be clunky. The helpful, logical, and clearly defined movement of the Pictwo interface is lovely and inviting. In addition to the well-executed navigation, the Pictwo developers added nice tools and opportunities for refinement. You can use a mirror image of a photo. The mirror image can be adjusted on the horizontal or vertical axis–essentially giving you the chance to have three different perspectives of your photo. When you erase and draw to further refine your image in the last step before processing, you can finely tune the pixel size and resolution of the gesture control with a touch on the screen and adjustment of two volume control bars on a pop-up screen. The well-planned navigation coupled with unexpected, nuanced details create a successful Pictwo iPhone app experience for a reasonable $1.99 and even better at its current sale price of $.99. AppSafari review of Pictwo – Layered pics for you iPhone was written by Jenni Ward on July 6th, 2012 and categorized under App Store, Photos, Video. Page viewed 3907 times, 1 so far today. Need help on using these apps? Please read the Help Page.